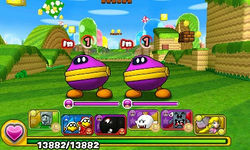 World 1-5 is the fifth course of World 1 in Puzzle & Dragons: Super Mario Bros. Edition. 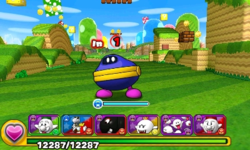 It is a basic, grassland level with enemies consisting of Goombas, Paragoombas, Green Koopa Troopas, a Green Koopa Paratroopa and a Coin Coffer. This course is unlocked by taking the secret exit in World 1-4. This level is straightforward, consisting of three battles (the third battle having a Coin Coffer), a ? Block, then a boss fight at the end with two Paragoombas and a Goomba. The player has Fire, Water, Wood, Light and Heart Orbs on the Orb field. The boss battle of World 1-5. Paragoomba (Boss battle) ? 889 1334 (Tackle) 16 2 ? ? Goomba (Boss battle) ? 635 826 (Bash) 16 2 ? ? Two Coin Coffers appearing in ★World 1-5. ★World 1-5 is a difficult version of World 1-5 from ★World 1, with Dark Orbs appearing on the Orb field while Heart Orbs do not. The third battle now contains two Coin Coffers instead of one. Paragoomba (Boss battle) ? 4662 6993 (Tackle) 154 2 ? ? 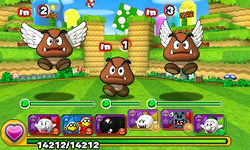 Goomba (Boss battle) ? 3743 4866 (Bash) 178 2 ? ? This page was last edited on August 12, 2017, at 17:23.